Last week we visited Leith’s in west London, to sample some of the delights that Leith’s have selected from the ASDA range as their top hits for Christma in the “Extra Special” range.. It’s an interesting partnership, as I think we have some ideas in our minds about which supermarkets are more ‘foodie’ than others – I certainly did. However most of us nowadays are looking for both certain standards of ingredients and value for money so this arrangement looks promising. Leith’s were frank about their unwillingness to compromise on quality and it’s going to be interesting to see what these two ostensibly different animals will come up as the relationship develops over the next eighteen months. We prepared a three course meal using combinations of the products from the range and lots of help from the lovely Leith’s staff. Our display went a bit awry when it became clear we’d sampled some of the honey and mustard baked sausages (but we were huuuuuuungry!) Lesson learned: next time eat three of the dozen in the pack and leave a nice presentable nine. They still tasted good. We made fast cheaty canapés using some of the ingredients in the range, such as goats’ cheese and walnut topped crostini, drizzled with yet more honey, and peppered smoked salmon flaked into cream cheese and loaded up with horseradish. Main course was beautifully cooked venison which, heretical as it would be to my family, I could see as an alternative main course for the 25th. Not in my house, but I understand some people aren’t fans of turkey?! Christmas pudding, All-Butter Mini mince pies, Hazelnut & Fruit Stollen, Yule Log, Roast Pork and Crackling Hand Cooked Crisps (beware, these are more addictive than crack), Forest Fruit Butter Crumbles, Applewood Smoked Cheddar and winter chutney Hand Cooked Crisps, Fairtrade Columbian Roast and Ground Coffee, Artisan Biscuits for Cheese, Florentines, Black olive Breadsticks, Continental Delicacies, Gruyere and poppy seed twists, All butter Sundried Tomato and cheese Crumbles, Cava, Cranberry Sauce, Caramelised Onion Chutney, and to top it all off, a jar of Goosefat! Q: What will you be eating on Christmas Day? The competition opens at 13:30 on 6 December 2011 and closes at 23:59 on 14 December 2011. There are two ways to enter – by answering the posed question on this page or on the OMG Facebook page. You may enter using each method once, for a total of two entries per person. The winner will be chosen via a random number generator. 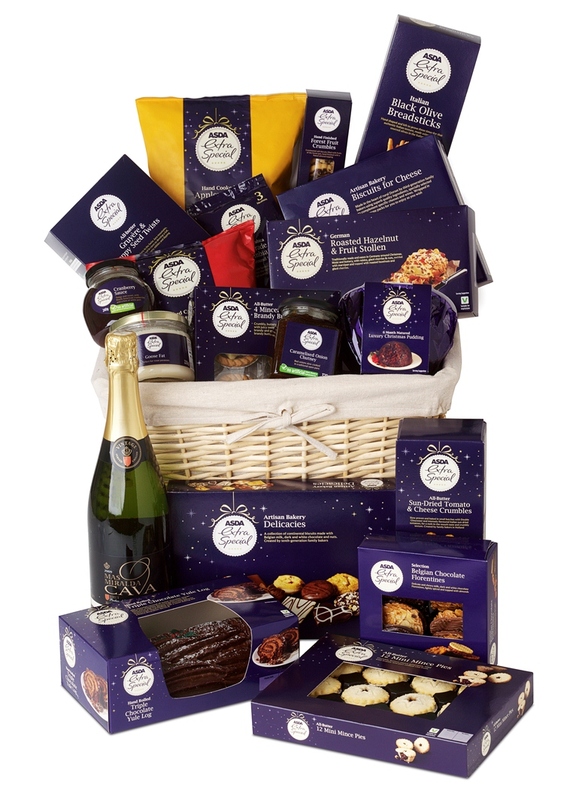 There is one prize of a hamper of ASDA Extra Special products, as listed though the promoter reserves the right to make substitutions if necessary. This competition is being run in good faith on behalf of ASDA, who will be responsible for sending the prize to the winner. Their decision is final and no correspondence will be entered into. They reserve the right to substitute the prize for one of a similar type / value if the prize above is not available. Instructions form part of the terms and conditions and by entering you’re agreeing to participate under these terms and conditions. I’m not surprised you ate some of the sausages, they look lovely! This Christmas I’ll be being ‘good’ as I have a bridesmaid dress to get into a couple of days after. That said, I’ll still indulge in some Bucks Fizz, a full turkey dinner and some Christmas pudding, followed by a long walk. We tend to have a big buffet on Christmas Eve too with lots of miniature dishes. Being good is going to be very hard! Roast Chicken! Salmon in whole grain mustard! Mince pies! Chocolate! My sister’s homemade soup! My mate Col’s meringues! And a lot of Gaviscon! Do I sound a bit excited? I think I am a bit excited. Lamb! We never, ever eat turkey. There’s only four of us, and turkey is a bit rubbish. Lamb is much nicer. And then Bailey’s. Because that’s the best of all the festive drinks. Gotta be turkey. I actually like it and with a store of chutney’s, relishes and spices in the cupboard using leftovers will pose no problems. But after dinner we’ll be tucking in to my chocolate plum pudding truffles, just perfect sized to pop into a mouth without too much effort and maybe a glass or two of something suitably sweet. Traditional for me … drop of rum in my morning coffee then a G&T while in the kitchen. Bottle of Cava then some sloe gin and maybe a drop of port to finish things off. Food? Anything that goes well with the drink so some nibbles, roast turkey, Christmas pudding and some rather smelly cheese! Sadly, like Emma, I am ‘being good’ at the moment, but that won’t stop me eating beef bourguignon (sp?) on Christmas Eve, eggs with smoked salmon, full turkey roast and most of a cheese board on Christmas Day and my dad’s meat and potato pie on Boxing Day. ‘Tis the season, after all! 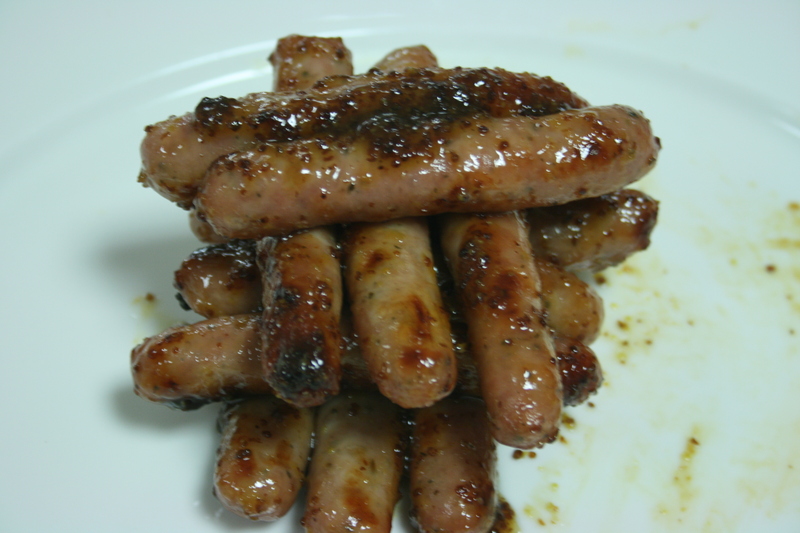 Mmm the mustardy sausages look good and sticky. We’re creatures of habit at Christmas – champagne and gougeres (cheesy choux pastry puffs) for breakfast, soup for lunch (I’m making pheasant and chestnut this year) then the big turkey-and-all-the-trimmings in the evening. Plus the odd piece of Lindor and Terrys Chocolate Orange… I’m salivating already! I’m a Christmas-oholic, and it’s still got to be traditional on the day. Bacon sandwiches on crusty white bread with bucks fizz, mince pies and clementines through the day, then the biggie: hot smoked salmon and prawn terrine followed by brined turkey, cranberry and orange stuffing, sage, onion and sausagemeat stuffing, pigs in blankets, roasties, mash, roast parsnips, carrots, peas, sprouts, cranberry sauce, gravy. Then, when everyone can summon up the space and energy, caramelised orange trifle and/or Christmas pud with cream or custard. (Those still not hospitalised get mince pies with brandy butter to finish them off!). Whoop! Turkey dinner, Christmas Pudding, Mince Pies! Totally traditional ….. roast turkey and Xmas pudding. turkey with all the trimmings! We will have turkey and beef as some people don’t like turkey and all the traditional trimmings. My cousin’s cooking this year and has so far mentioned about 10 different desserts so I’m not sure what we’ll get! Turkey turkey turkey. People who don’t like eating turkey are probably hanging out with people who are cooking it wrong (so I’ve had a few converts tell me over the years). Prawn cocktail starter, dinner with all the trimmings (first sprouts and chipolatas of the year!) then christmas pudding or jaffa cake trifle to end. Yum. A traditional turkey Christmas dinner with all the trimmings, followed by copious amounts of chocolates. will be steak and chips christmas eve (tradition!) Then on Christmas morning it will be canapes and drinks till 2pm, followed by full turkey roast with profilaroles and hot chocolate sauce for pudding! The evening will be spent divided between chocolate and cheese! Salmon for starters followed by turkey and then trifle. I’ll be in Spain so nothing traditional, maybe Paella! anything that doesnt move quick enuf , ive been on a diet and intend to eat my now lighter body weight in xmas goodies !! Got to be Turkey and all the trimmings! I am going to my daughter’s for Christmas Dinner so it will be huge as my son in law cooks that day and he always puts too much on the plate! It will be: Turkey with pigsin blankets, carrots and turnips, briussel sprouts, roast potatoes, cauliflower, swede and gravy. For pudding we will have either Christmas pudding with brandy or rum sauce or a mince pie with cream. I don’t normally drink so it will be an Irish coffee to round it off and then I will be stuffed and unable to move for several hours. It is always delicious though he is such a good cook. This year I will have a large number of the family to cook for, so I’m planning a 3 bird roast, stuffing, roast potatoes, carrots, parsnips, pigs in blankets, yorkshire puddings. Lashings of gravy because well it is Christmas after all. With Christmas pudding and brandy sauce for desert… Perhaps a glass of something fizzy to wash it all down. Now if only Santa could send me the chef to do it all for me, a woman can dream. will be a very traditional dinner – soup then turkey with all the trimmings then christmas pudding! I will be cooking both pork and chicking with all the trimmings. I’m doing guinea fowl this year. It’s the pick a different bird each year game. Far too much. Croissants and parma ham for breakast. Traditional turkey with all the trimmings for lunch. Then party food for tea. Lots of chocolates in between. Bringing a bit of Britain to Italy, I’ll be making a Christmas turkey with all the trimmings over there! I will have to take all the ingredients in my suitcase though…bacon, cranberry sauce and obviously a nice Christmas Pudding with brandy sauce to finish off the meal! A very traditional turkey and xmas pudding meal at my home ! I try to do something a bit different each year – this time its baked parmesan parsnips – but I always get the same response – ‘dont change it because we love it the way it is’. A full English breakfast followed by chocolate then a late dinner of roast turkey and all the trimmings and plum pudding and brandy sauce and then later perhaps more chocolate! definitely turkey and all the trimmings, I especially look forward to the pigs in bacon – my favourite 🙂 I always buy loads of chocolates thinking that I’m going to be a piggy but I never touch them! This year I will be eating Turkey, best roast potatoes, sausage stuffing, pigs in blankets, sauteed cabbage, other trimming and Pecan Pie! Oh, and lots of Baileys, Port and Wine. P.S. How did you manage to ONLY eat one? I’d have scoffed a lot more. 1 million pigs in blankets as they are THE best. Not one sprout shall pass these lips. Has to be Turkey with all the trimmings!….only once a year,right? Turkey and all the trimming, I love all the trimming like pigs in blankets yum! turkey, turkey gobble gobble gobble!! Thus year I’ll be having my first christmas dinner cooked by myself….wish me luck! I hope I don’t end up in a&e with food poisoning and come to think of that I hope that the three men in my life tha I’m cooking for don’t end up Ill either!!! Full on Turkey roast with all of the trimmings. YUM! 😀 bar sprouts…obviously. Turkey with the works (pigs in blankets, roast potatoes, stuffing, veg). Yummy! I’m a tradionalist – so its full roast Turkey for me too – but I do have the sprouts in a mustard cream sauce. We are having slow-roast pork shoulder with some sort of (as yet undecided) fruity, nutty stuffing and port gravy!! Has to be free-range turkey with all the trimmings followed by home-made Christmas pudding. Probably lamb as no-one likes turkey! Mother is coming over from the USA; so I’ll be cooking a USA/UK hybrid of dishes….Gammon for Christmas Eve plus some other undecided sides, then on the big day: Turkey + stuffing, roasties, mash, sprouts w/ crisp pancetta, glazed carrots, a couple types of cranberry sauce, gravy, pigs in blankets, some other veg as well, and then haven’t yet planned the puds (but they will be numerous and appropriately winter-y). Probably a terrine or similar for starter – basically anything that can be prepared a day or 2 before. Hungry now. Lunch: Turkey Christmas dinner with everything, piggies in blankets, yorkshire puddings, my hubby cooks it all and he makes a lovely gravy. Dinner: Something very, very light such as Turkey rolls. A full traditional Christmas Spread but with lots of extra treats and nibbles about the family will all be there so we will make sure there is something for everyone and thats all thats important! We’ll be eating a lovely local free range turkey and all the trimmings. Plus homemade Xmas pud for dessert. Yum! I’m still a bit undecided- either a traditional but veggie feast, or Indian celebration food. If the latter I’m going for a full on biriyani with loads of ghee, and lots of side dishes. Whichever option it is will be followed by several Lindt Lindors and then a lie down! My first British Christmas – no idea of what exactly it will consist of, but I have been assured that we will have a vegetarian version of a traditional Christmas dinner! Plus loads of cheese, including Cornish Blue, one of my favorites. All very traditional – special recipes that we have each year – we do not like change ! Champagne and smoked salmon blinis at 11.00 Then at 1.00 Turkey wirh coriander and walnut stuffing, pigs in blankets, butter forcemeat balls, orange and ginger carrots, roast pots, yorkshire puds ( I know not traditional but we love them). Filo butternut squash, vegetable and pinenut pie, cranberrry sauce & gravy. I was invited to an Indian Restaurant but that isnt right – Proper Xmas dinner with all the trimmings for me! ham and all the usual trimmings followed by banoffee pie – yum! I’ll be eating way too much! Including Butternut squash wellington with all the veggie trimmings and lashings of gravy, then Christmas pud and custard, followed by chocolates! I’m very much hoping that I will be eating goose, but turkey is more likely. We are having turkey, braised red cabbage, roast potatoes and parsnips, pigs in blankets, brussels with chestnuts, swede and carrot mash, bread sauce, gravy, cranberry, then christmas pudding with brandy butter and clotted cream. If we’re still alive after all that we’ll have cheese! Some roast beef. I cant stand turkey! Smoked salmon and goat’s cheese tartlets, goose and mountains of veg, homemade mince pies and Christmas cake, buckets of fizz! Can’t wait! we haven’t yet decided between a turkey or a three bird roast – but it will definitely be accompanied by stuffing, pigs in blankets, roast potatoes, mashed potatoes, carrots, brocolli and sprouts………..as well as whatever else gets cooked! Were having slow roasted lamb for lunch as were really not turkey fans. The dog has never forgiven us after 2009 where he pretty much had the whole thing! Then Im making a HUGE sticky toffee pudding with dates and a homemade vanilla icecream. Delicious! – if it all goes to plan. A roast dinner haven’t chosen the meat yet but will be having carrots roasted potatoes and parsnips , sprouts peas and mashed potatoes,Trifle, Christmas cake, mince pies . Pork pie , cheeses, sausage rolls meat pickles etc later in the evening. and not forgetting lots of chocolate which will be fitted in between everything else. We are only two so we’ll be having stuffed turkey breast (if we cooked a whole bird we’d still be eating it in September!) with honey-roasted parsnips, brussel sprouts, roast potatoes and, to follow, caramelised oranges (the Christmas pudding comes in the evening, when we’ve digested the rest! Home-made French Onion Soup to start (made by my brother in law), then turkey and beef with all the trimmings for the main course. I’m doing dessert and I haven’t decided what to make yet. I quite fancy a chocolate orange cheesecake, or something with Baileys in it. There’ll be masses of food as there’s16 of us including the children. And I’m hosting this year – eek! I’ll be eating a barbecued turkey…we’ve been talking about doing it for years and it’s finally going to happen 🙂 (with our usual american style stuffing of course). MMM! I will be eating mother in laws tough turkey wing with a large helping sour mashed swede, yum can’t wait! Tiger Prawns to start, followed by a Traditional Turkey Dinner, Followed by Cheese and biscuits, all courtesy of a nearby restaurant! We shall have a houseful at Christmas so will serve Turkey and Ham, loads of vegetables and a few special things like pigs in blankets. a massive crimbo dinner, and lots of chocolate! Turkey, I just love it! I buy one far bigger than necessary just because I can’t get enough..first a proper traditional roast dinner, roast and mashed potatoes, sprouts,carrots,peas, etc and delicious gravy, then in the evening turkey sandwiches with fresh white bread..I can’t wait!! We’re having a freerange rooster, with all the trimmings. Never keen on Christmas Pud, so there’ll he a trifle if anyone has room. A traditional roast turkey dinner with all the trimmings and lashings of vegetables and gravy. I’m going to have a go at cooking a chocolate mousse cake this year for pudding – fingers crossed it turns out ok – but I’ll also cook the Christmas Pudding with Custard. Seeing your picture of sausages I am tempted to say those, but I guess it will be the traditional turkey, stuffing and all the trimmings with a glass of something bubbly to toast absent friends. Turkey crown with pork and apricot stuffing, sprouts, parsnips,roasties etc, followed by Hester Blumenthals candied ornage christmas pud – can’t wait! We’ll be eating Roast Beef & Homemade Yorkies with lashings of gravy. Gave up with Turkey a few years ago. I will be attempting a five bird roast this Christmas with roast potatoes, glazed parsnips, brussles with chestnuts, carrots and some spiced red cabbage. We will have bacon butties in the morning. For tea we will have butties from the leftovers. Not bothered about turkey so will be having chicken and duck, roast potatoes, creamed potatoes and lots of yummy veg ( my 7 year old daughters best part of the meal is sprouts) Yorkshire pudding, little sausage and bacon wraps, stuffing and cranberry sauce. Followed by a Xmas pudding that everyone will be too full to eat. Cant wait my hubby will be cooking and we are having my family over this year, so happy i have got day off as I work in a hospital and thought i would have to work this year. Turkey will ALL the trimmings, yum yum cant wait!! Roast chicken for us, and no brussels!!! Turkey , ham and pork. I will be sticking to the traditional Turkey dinner, although some of the food on display here will make me think twice about going for boring fayre. I’ll be eating …. far too much! We’re all going to my brother’s house for Christmas Day, so we’ll be eating whatever he has prepared, along with mince pies and mulled wine. mmmmmm, mulled wine ……..
Turkey, turkey and more turkey with roasties in goose fat, sausages wrapped in bacon and a little bit on veg (husband doesn’t like too much – he prefers the rest!) and of course cranberry sauce and the homemade chestnut stuffing my mum gives us every year. Then later on turkey or gammon butties! I’ll be having turkey with all the trimmings. What will I be eating? Anything and everything……yum!! Smoked Salmon bagels for brekkie and traditional Roast Turkey dinner with Xmas pud 🙂 there will be no room for any supper!! We normally go to our local chinese on Christmas Day (I know, random, but it’s become a tradition!) but they are closed this year so we are reverting back to turkey. I’ll be having a Pheasant and Duck Roulade! If eating/drinking on christmas day was an olympic sport – I’d be on the top of that rostrum no bother. It will be bucks fizz in the morning with scrambled egg/toast/bacon – later on it will be the full Christmas Traditional fare – vegetable soup followed by the ‘xmas works’ – turkey, ham, roasties etc. etc. smothered in gravy & cranberry sauce – guzzled down with a glass or 3 of rose wine. Once I’ve changed into the old jogging bottoms to make room for more …, it will be a few glasses of baileys on ice with stilton, crackers and some grapes (to keep up my 5 a day). Finally it will be a few turkey/cranberry/stuffing sarnies washed down with a mug of tea and 1/2 a selection box….. wish it was Christmas Day already!!!! Then come 1st January… its off to slimming world!!!.. This xmas I’ll be eating as much as I can of the loveliest food!! Somked Salmon, prawns, mussels to start – then turkey and all the trimmings and cheese and crackers for puds – lovely!! Diet starts in Jan! Turkey, with all the usual trimmings. I am most looking forward to the roast potatoes, the one time of year that they are made in my household! We will be having a really nice piece of beef. Hate turkey. We be at in laws . So minestrone soup to start. turkey, stuffing, roast potatoes, carrots, those little cocktail sausages with bacon wrapped round, gravy, parsnip maybe, definitely no sprouts, mince pie and cream, loads of chocolates. i absolutely cannot wait. I’ll be having the full monty!!! Yummy turkey and all the trimmings!!! I’ll even have a brussel sprout on my plate (you have to at Christmas!!) although I won’t be eating it!! I’ll be sneaking it on to someone elses plate halfway through the meal!!! Haha!! It makes my mum laugh that I insist on having a brussek sprout even though I won’t eat it!!! My mum usually cooks a selection of meats, excluding the traditional Turkey since noone likes it that much apart from me. It’s just me, my mum and dad this year, Since my Brother and Sister both have other plans. So were just having Lamb =) Which I will no doubt cover in mint sauce haha. Roast Duck & Baked Alaska Nom NOm NOm!!! On Christmas Day, I’ll be having a light breakfast of smoked salmon and poached eggs in white wine vinegar and water, with juice. This will be very early, as I’ll be cooking dinner for everyone. Then, for dinner, I’m cooking roast duck, parsnips, brussel sprouts glazed in lemon oil, yorkshire puds, gravy, and potatoes. We’ll be having a selection of side dishes, including sausages wrapped in crispy bacon, and we’ll be having a homemade Christmas pudding for dessert! Chicken!! We have chicken & topside beef. I don’t mind turkey, but for the price I would have to LOVE it 🙂 So, we have chicken, beef, two kinds of gravy. All the trimming, 100’s of Yorkshire puddings (home-made of course) & my absolute favourite… Pigs in Blankets. Asda’s are the very best!! Roasted vegetables and potatoes followed by lots of ice cream! Dad’s famous Turkey Dinner with all the trimmings and homemade trifle! Just found out that i’m pregnant so trying to stick to a healthy balanced diet! No over indulgence! Well thats the plan anyway! Lots of cabbage and spinach full of folic acid which is good for the baby! Organic free-range turkey and organic vegetables – will be sharing this with my rescue greyhounds – then pink blancmange for desert! Prawn and Crab terrine, Turkey Crown with loads of roast spuds, veg, pigs in blankets and my own cranberry sauce, followed by Christmas pud and brandy butter….if we have room….if only I didnt have to cook it all!! Traditional Christmas dinner – hopefully with a few sprouts (I am the only one that eats them so they often get overlooked), Christmas pudding and then the day will be interspersed with far too many Quality Street chocolates and the row about who has eaten the most delux toffees! Every year we ruminate about having something different and every year we stick with the tried and tested traditional turkey Christmas dinner. I will probably have my annual foray into my favourite cheese – stilton (banned the rest of the year as my wife cannot bear the smell of it) and then hopefully Father Christmas will bring me some After Eights – sorted! I’m going to have the usual suspects in the veg department , plenty of flurry , mashed potato made with loads of butter and I think I’ll be trying an alternative to Turkey this year … A nice nut-roast maybe ! Deep fried Mushrooms, Turkey with all the trimmings, and Christmas pud that we’ll probably all be too stuffed to eat! Traditional christmas dinner…turkey, carrots, sprouts, cranberry sauce, and heaps of crispy roast spuds, all cooked to perfection.